Arizona, Oklahoma, Colorado, West Virginia and others now...tens of thousands protesting. They shouldn't have to do this, the civil unrest, our nation the USA should have better priorities, automatically. Online, the sources I read suggest these protests are needed, even while regretting the need for them. I did not know priorities were so badly skewed. Our economy seems to allow a few powerful people to enrich themselves at the expense of the many. My questions: Are things worse now than, say, in the forty years after the New Deal? Why don't people do more things just because it is the right thing to do? 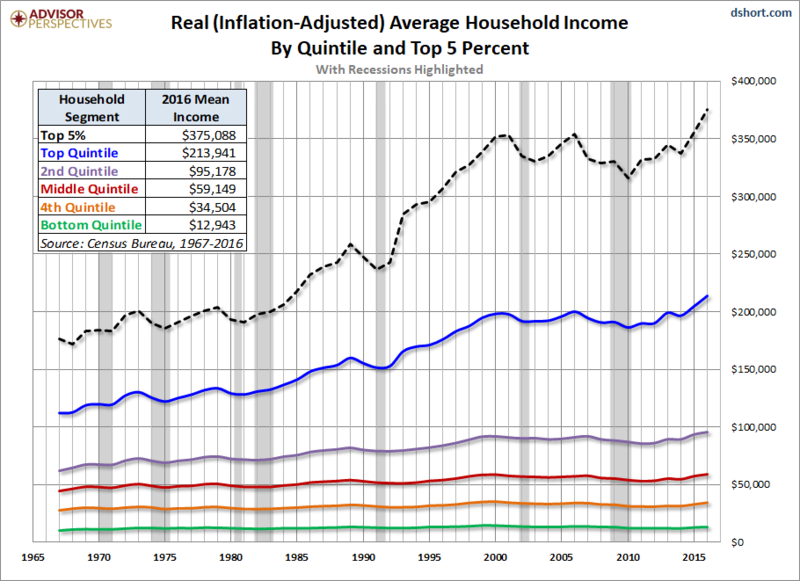 There is no doubt that the top quintile has done much better than others in real household income, increasing by about 80% between 1967 and 2015. The second quintile increased by about 50%, the third by about 30%, and the fourth and fifth by about 20% each. Some of this disparity might be explained by the breakup of the American family... a lot more single moms nowadays at the low end, and a lot more two-wage-earners at the high end where the family unit stayed intact. Interestingly, the largest increase in the disparity appeared during Clinton's presidency, and practically none under Bush 43, then it started increasing again under Obama. Hmmm... almost makes one think Democratic policies are designed to create a rich elite presiding over a large government-dependent underclass... Naah, sounds too third-world... can't be. Tink, your thoughts do give pause...however if what I am learning is correct, none of these are really the people who are causing the problem, because although $400K might sound big income to you and me, it's relative peanuts and not really enough to eviscerate the middle and low income folks? What I seem to be hearing (and "deep state" might be a piece of the puzzle here? ), is that the REALLY wealthy (often behind corporate guise) will go after (i.e., buy) the legislative and judicial branches to effect a truly massive shift of wealth upward; so that we are now, in effect, losing the middle class. And that you had to go back to "The Gilded Age" to find anything like this division of rich/poor. Also, that in the Great Recession 2008, the Obama administration did not even try to effect the kind of support the New Deal gave to restoring the middle class, who actually seem to be essential to a functioning democracy. For a capitalism democracy to thrive, trickle-up is what has worked, trickle-down does not. In other words, capitalism did not get repaired after 2008 like it did in the wake of 1929. So Clinton, Obama, Reagan, Bush...in this scenario none of them really relevant...something else was going on. Virginia, I'm really more inclined to think the breakup of the family had more to do with it, although I do agree that there has been too much concentration of wealth among the really rich, so let's do a little arithmetic. There are 540 billionaires in the country with a total net worth of about about $2.4 trillion. If you confiscate all the billionaires' wealth, and divide it equally among the US population of 320 million, you get a one-shot payment of $7,500 each, not exactly a fortune... wouldn't even pay for one year of college at a public university. Nevertheless, I do think anti-trust action needs to be taken against Google, Facebook, etc., not so much because they are making too much money per se, but because they have too much influence as a consequence of all that money. And the supreme irony is that many heads of these corporations pretend to be liberals, like Warren Buffet, who affects to be concerned that his secretary paid a larger percentage of her income in taxes than he did, yet his company, Berkshire-Hathaway has 'deferred' something like $68 billion in back taxes it owes. Tink I don't really understand all this to explain it well, it's too new to me...but I don't think it is so much the arithmetic...it's more a deepening, inexorable trend that funnels our resources our national wealth into the control/hoarding/dead end/deadness of a very few, with the masses Middle American losing access to opportunities from those resources. So schools go downhill until tens of K's demonstrators FINALLY must spend huge effort/energy speaking up, energy that could be given to the pupils; old people reservoir of experience and wisdom, get plundered into deprivation and early death by the very programs set up to facilitate their aged years. What I am saying is, I don't think you can just redistribute the wealth. There needs to develop somehow a Commitment To Do The Right Thing. We have the experience and the knowledge now, but we don't do it? Virginia, I agree that doing the right thing is important, particularly insofar as it affects older people on fixed incomes, and I also agree that this would not require a vast redistribution of wealth, just less greed on the part of of those who want to extract the last penny. Strange, but I don't think I've ever heard Bernie Sanders mention that; he just goes on and on about "the millionaires and billionaires," which, I suspect, he has no intention of getting rid of, at least not the ones that contribute to Democrats, and that's most of them. When I lived on Mt. Baker in Washington State, I became friends with the Mgr. and his assistant mgr. at Silver Lake County Park (you can imagine from the name how lovely that was). Funds were getting cut, so they had to put out a little toll both and collect $5 from everybody coming in. So, what if you were able to restructure things so that only $100 per Whatcom County person came out of offshore accounts where money just sits dead, and designated it for Whatcom County Parks? That would put (2017 population) 201,000 x 100 = $20 million into a New Deal type program and hire people to spiffy up the parks and make them totally free. Wouldn't even change the standard of living for the uber-wealthy one iota...as for how to carry this out? Well I read that FDR went to the wealthy and basically terrorized them with (true) tales of how lefty-pinko-types were taking to the streets and threatening to crash capitalism altogether, so they better ante up. But what if you could just set a voluntary standard in the USA of equity and access to opportunity, i.e., doing the right thing? (Sigh) well some months ago I recall TinkerBell asking WHERE IS CINCINNATUS WHEN YOU NEED HIM? Indeed, Virginia, where is Cincinnatus? Somehow, I don't think it's Bernie. Hi Tink, yes that college presidency stuff of Jane Sanders does not look good, however I am doing my best to remain skeptical there, in case it turns out to be basically a campaign to discredit Bernie, because he made an unexpectedly successful attempt to upset the powers-that-be. Virginia, what caught my eye originally about this case is would Bernie's wife have been appointed president of the (now defunct) Burlington College in the first place if Bernie hadn't been mayor of Burlington at the time? And yes, Hillary's crookedness vis-a-vis Bernie probably cost her the election, with lots of Bernie supporters not voting for her. I apologize for misleading people to thinking the picture I posted of Jon was me. My mistake. Do You Think It's Possible That Some People Are Just Born For One Special Reason, A Task To Accomplish? April 11 is National Pet Day, if you have a pet or animals to take care of, are you going to do something special for them? If the Principal called you and said your son brought a gun to school, how would you handle it?